Easy to put on. No openings for heads or feet to go through. Lightweight and comfy. They feel good because they’re soft and yielding. No seams press along the spine or tummy. Nothing irritates them when they’re in the coat. Nothing is too tight or endlessly pressuring. Generously sized for maximum coverage. Chests, necks and tummies are well covered by wide panels. 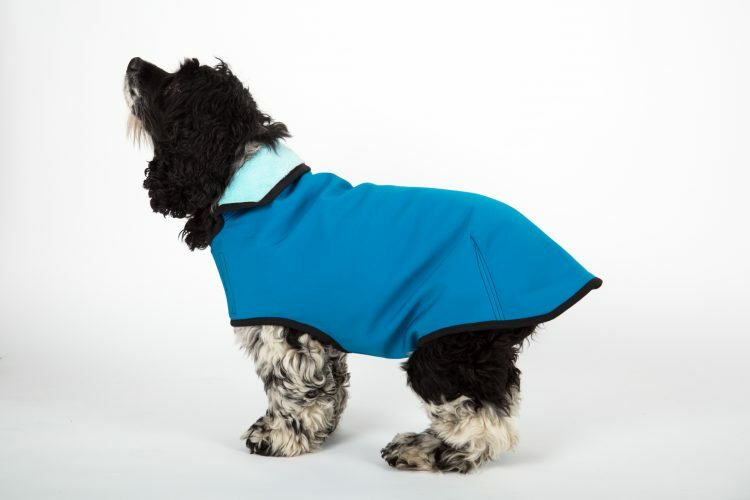 Our coats are designed for dogs with deep girths. Shoulder openings are long and low. They‘re carefully designed to maximize range of motion and coverage. Contoured seams over each hip shape the coats to the dog’s body. This allows the coat to drape softly down the down your dog’s body and be lower to the ground. A better fit keeps out cold air. All coats have a collar to protect the vulnerable neck area. Lots of adjustment choices for deep chested and muscular dogs. Several strips of velcro on each panel allows you to adjust for your dog’s individual shape. Correct fit will prevent snow from collecting at the chest or tummy. Longer back length so that the hindquarters are well covered. Coats can be made in the draped version which covers thighs and legs nearly to the knee. Small alterations are on us. That means if a panel is too long or short, needs to be widened or narrowed we’ll fix it so that your dog’s coat fits him or her correctly.